Angelique Kidjo Gives New Life To Talking Heads' 'Remain In Light' Talking Heads' classic Afrobeat-inspired album gets the cover treatment by the Beninese star. 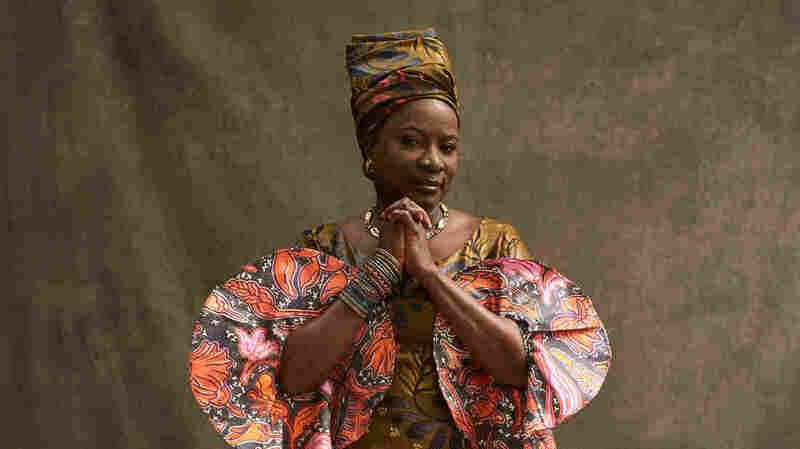 In 1983, Angélique Kidjo moved to Paris from her native Benin. An upstart musician, she wanted a new life away from the communist regime of her native land, where she could listen to hits, not propaganda, on commercial radio. Once in Paris, Kidjo attended a jazz school and absorbed all the music she could. "...I became a music junkie," she recently told the Los Angeles Times. During her studies, she came across the single, "Once in a Lifetime," an Afrobeat-inspired tune from Talking Heads. Encouraged by the African sound of the record, Kidjo told her fellow students about the rhythms she heard. They insisted — incorrectly — that it was rock. "I said, 'That's not rock and roll," she told the L.A. Times. "It's African music." Perhaps fueled by that experience, Kidjo's Remain in Light recreates the 1980 LP as an authentic Afrobeat record that dives head-on into the Fela Kuti-inspired aesthetic of the Talking Heads original. Though a widely heralded classic, the group's album only scratched the surface of West African funk. They synthesized the sound, blending it with pop and rock to make it more palatable for mostly white American listeners. Conversely, Kidjo's interpretation feels more legitimate and offers an unfiltered representation of the Motherland's polyrhythmic dance. Take "Listening Wind" as an example: above a gentle mix of djembe drums and oscillating synths, Kidjo tells the story of a man named Mojique, who sees first-hand the colonization of his village. "He sees the foreigners in growing numbers," she sings. "He sees the foreigners in fancy houses." There's a measured sadness to Kidjo's voice, as if she's living the trauma herself. The song connects here as much as it did in 1980: Gentrification has quickly taken hold across Africa and throughout major cities in the U.S., and people of color are forced to leave communities in which they've lived for generations. "Seen and Not Seen" delves into society's standards of beauty: Kidjo remixes Talking Heads' spoken-word poem, using resonant chants to detail a man's struggle to accept his physical features. The man in this imagined tale is presumed to be a person of color; the media he consumes is full of white faces. Perhaps on purpose, Kidjo's version of "Once in a Lifetime" is arguably the best song on this set, as it maintains the festive nature of the Talking Heads cut, while adding deeper percussion to it. Equally nostalgic and carefree, Kidjo's version is marked by a creative freedom that taps into her formative years as a nascent visionary, who was determined to tell the world about Africa's strong influence on Western music. Thirty-eight years after the landmark album, Remain in Light gives new life to the original while further illustrating Kidjo's grand majesty.